Imogen's Typewriter. : My #5Books7Days Readathon TBR! 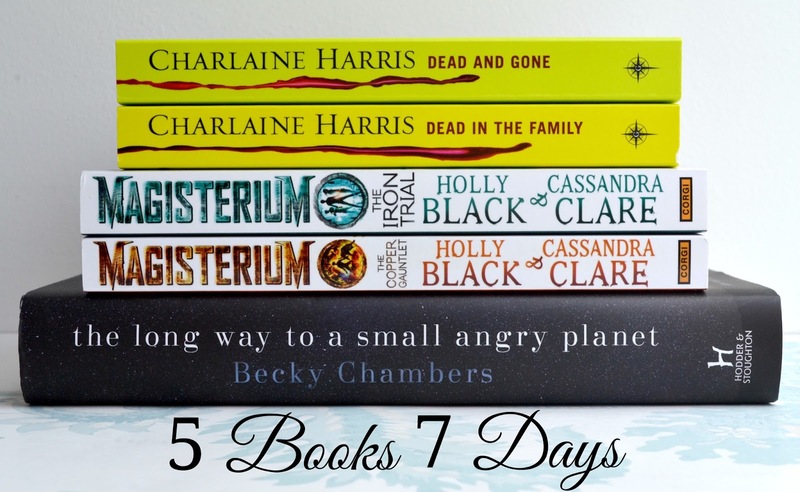 The #5Days7Books readathon starts on Monday, runs from the 10th-17th and I'm really excited. I hit a bit of a reading slump at the end of July/ beginning of August so I'm hoping that this will get me out of it. There are just so many books on my TBR that I'm dying to read! Plus, this coincides with a trip down to London and the two two-hour train journeys are perfect for reading. So what will I be reading? I'm currently reading From Dead to Worse and hopefully I'm going to finish by tomorrow for the start of the readathon. I'm loving this series and these are the last two books of the set of ten I own. Once I finish these I need to buy the last three so I'm holding off until I have read all the books I have until I buy them. Trying to curb that book buying! I have a lot of confidence in Charlaine Harris's writing and they're nice quick easy books for a readathon! Both of these have popped through my letterbox in the past two weeks and there's been a lot of hype around them in the past year. I really liked The Spiderwick Chronicles that Holly Black wrote with Tony DiTerlizzi so I'm hoping I'll like these just as much because- and this is pretty unheard of in the book blogging world- I've never read a Cassandra Clare book before. Yep. These will be my first. Also, I've been really liking magic in books lately since I read Half Bad. This is a debut novel that originally had huge success on Kickstarter and was then picked up by Hodder & Stoughton. It's being published half way through the readathon on the 13th and I'm hoping to get a review up for you as soon as possible because I'm really excited about this one. I think it's going to be great. Sci-fi is one of my favourite genres it's hugely under-represented on my bookshelves so this will be something different for me. Are you joining the #5Books7Days readathon? What are you going to be reading? *These books were sent to me for review. I am not obligated to talk about them. Amazon links are affiliate links.